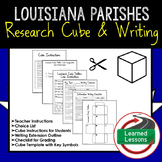 Use this as a fill-in for the study of Louisiana history and the study of all 64 of Louisiana parishes. This Power Point includes slides on all 64 Parishes in Louisiana. The slides include information about the Parishes- Parish seat, year formed, population, size and population rank. Followed by a map of Louisiana so students can see where the Parish is located on a map of the entire state.